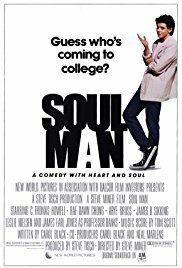 Brief Synopsis – After being accepted to Harvard Law School, a young man is cut off financially by his parents and must try and get a minority scholarship in order to still attend this prestigious school. My Take on it – This is a film that I recall seeing back when it was on cable when I was a kid and all I really remembered was the basic premise. I can understand how someone could think that such an idea might work as a social comedy but apparently when it came out in the 80’s, such a premise seemed more acceptable than it does now in the modern PC world we live in. Watching it now, this premise seems extremely racist no matter how one looks at it. Personally, I’m a big fan of social comedies, but the problem here is that this film pretty much fails to be funny in any of the social issues it presents. C. Thomas Howell was considered a great actor in teen films of the 80’s and I can understand why they would give him this role yet he somehow just doesn’t manage to make this performance work no matter how hard he tries. Bottom Line – Film that was probably perceived as being much funnier at the time but now seems extremely racism and very un-PC. Howell was quite a catch back when this was made, but he doesn’t manage to do such a great job with this role. I’m all for social comedies, but I prefer them to actually be funny which this film unfortunately isn’t.